Bristol Zen Centre is an informal zen community or sangha affiliated to Furnace Mountain Zen Centre (FMZC) in Kentucky. Our guiding teacher is Zen Master Dae Gak of Furnace Mountain Zen Center. BZC was set up in 1998 by Kosen Osho and Soen Wol Sanim, senior students of Zen Master Dae Gak. We were originally known as The Wednesday Zen Meeting. We currently meet every week on a Tuesday evening for meditation practice at Fulcrum House in Redland, Bristol. As well as our regular Tuesday evening practice, we offer a year round schedule of workshops, and residential and non-residential retreats. Zen Master Dae Gak leads a retreat in the UK every year. We welcome people of all levels of experience and meditation instruction for beginners is always available from senior students. 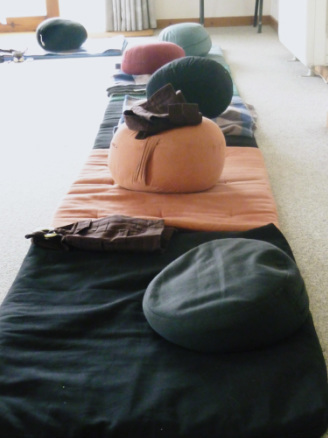 We offer formal zen training in an informal setting. We are a small and friendly group. Following in the tradition of our lineage, we provide an opportunity for open and dynamic spiritual inquiry. Our hope and intention is to awaken to our original compassionate nature for the benefit of all beings.